During your first visit to Yonge-Steeles Family Wellness Centre, our goal is to discover the underlying cause of your pain and how we can help. After a warm greeting, you’ll get a quick tour of office and then we’ll get started. You’ll fill out your New Patient Questionnaire at our office. We also encourage you to bring any insurance information you have available. Next we’ll do a pre-exam, including a nerve scan and posture analysis before Dr. Stevenson comes in for your consultation. After a detailed exam, we’ll explain our recommendations for your care. On this visit, we’ll go over your Report of Findings, answering any questions you may have. If you choose to continue care and maintain a wellness lifestyle, you will benefit from maintenance visits. Regular adjustments can help keep you healthy and happy. Just like regular visits to the dentist keep your teeth healthy and gym visits make you feel good, chiropractic care helps your body perform to the best of its ability. We will work together to decide how often you visit for maintenance care. We do health lectures on varying topics such as chiropractic care, stress, exercise, headaches and more. Yonge-Steeles Family Wellness Centre has participated in or hosted company health fairs at local businesses and conventions, major corporations, banks, P&G, government buildings, police, and more! We provide a mini health consultation for your employees, offering services like massage, naturopathy, and reflexology free of cost. 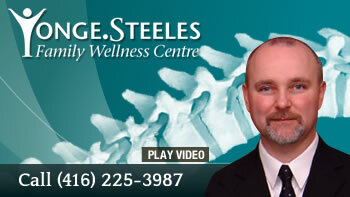 We also perform spinal screenings, posture analyses, and thermal scans. Our goal is to share the benefits of chiropractic care and how it can help your employees achieve whole body wellness. Healthy employees are productive employees!